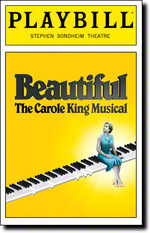 Beautiful tells the true story of Carole King’s remarkable rise to stardom, from being part of a hit songwriting team with her husband Gerry Goffin, to her relationship with fellow writers and friends Cynthia Weil and Barry Mann, to becoming one of the most successful solo acts in popular music history. Along the way, she made more than beautiful music — she wrote the soundtrack to a generation. Long before she was Carole King, chart-topping music legend, she was Carol Klein, a Brooklyn girl with passion and chutzpah. She fought her way into the record business as a teenager and, by the time she reached her twenties, had the husband of her dreams and a flourishing career writing hits for the biggest acts in rock ‘n’ roll. But it wasn’t until her personal life began to crack that she finally managed to find her true voice. This is a FANTASTIC event that we saw in Chicago at the Oriental Theater on a Wednesday afternoon. It's phenomenal as a story, a history lesson, and as a concert and should not be missed.